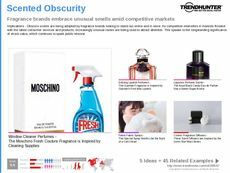 Find Better Ideas, Faster ® with a custom perfume trend report, our PRO Dashboard and 80+ categories of premium trend reports. The Perfume Trend Report gives an insightful analysis on perfume names, scents, ingredients and bottles that are most popular in the realm of cosmetics for women. First, we delve into the scent profiles and ingredients that various demographics are drawn to. For instance, older women tend to prefer muskier smells, while young women like sweet or spicy scents. 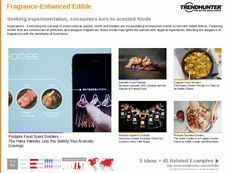 DIY fragrances are also examined with an increase in maker culture as well as mobile apps developed to help women determine the scent that matches their style. This beauty-focused report is a great reference for fragrance developers working for cosmetic brands as well as cosmetic retailers to create unique and interactive ways for attracting consumers to purchasing a perfume. It also has insights for professionals in hair care and body cosmetic brands, inspiring scents for lotions and shampoos as well. Sparking ideas for unique and attractive scents, bottles and marketing campaigns, the Perfume Trend Report offers an in-depth analysis of fragrances for women.